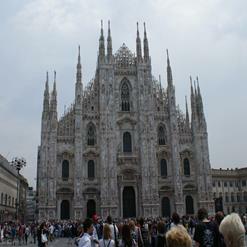 It is the Museum of the Cathedral of Milan which displays the 700 year old history of construction of the cathedral, with outstanding walk-in wooden models, facade designs, sculptures, drawings, stained glass, paintings, tapestries, paintings, graphics and sacred vessels. The Cathedral Museum is a medium to get closer to the Duomo, and tell the succession of its phases of construction, from its foundation to the recent restoration. Museum is currently closed for renovations.